The Board of Supervisors voted 5-3-1 on Thursday to keep the initial amount proposed by the County Administrator for the schools based on their preliminary fiscal guidance set back in September and add in an extra $1.6 million left over after the county side of the budget deliberations completed. This reduced the tax rate by 5 cents to $1.155, which gives the average homeowner no increase in property taxes from last year, even though property values have risen on average 4.2%. Fixing the salary scale was a top priority for the School Board, and they could still choose to keep their $28.9 million plan to do so. In Fairfax County, the School Board has proposed reducing positions, mainly through attrition, in order to pay for similarly much-delayed compensation increases. Teachers in Loudoun County have not received their expected step increases on their salary scale in the last five years. In FY2009, the average LCPS teacher salary was $60,032. The current average LCPS teacher salary is $62,978, a 1% increase in 5 years. The School Board and LCPS commissioned a community survey back in December to help understand our budget priorities. Of the 10,153 respondents, 90% were parents of LCPS students and 76% said that the School Board should be investing more money for "Competitive salaries that attract the best employees." It was the largest majority of any budget question. Supervisor Geary Higgins suggested the School Board should fix the salary scale over two years instead of one, much as they did back in FY2001 and 2002. As a result of that correction, the average raise for LCPS was over 10% in both FY 2001 and 2002. 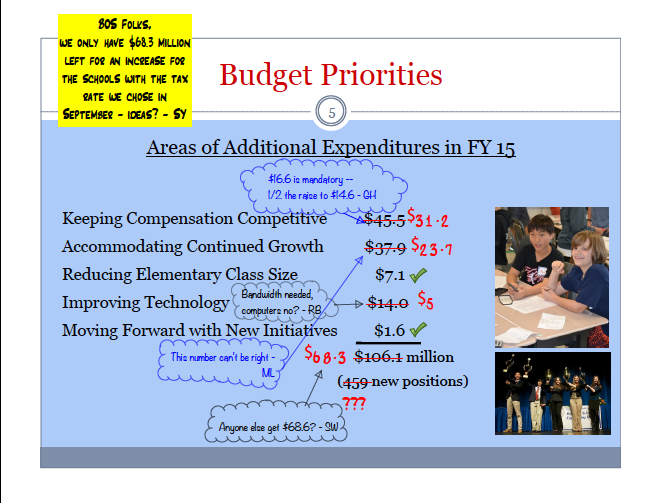 The School Board has proposed a correction with an average raise of only 3.9% in their budget request for next year. The School Board's ability to cut $14.2 million of the expected money needed from the amount allocated for new growth seems unlikely. Supervisor Matt Letourneau suggested that this number is being padded by LCPS staff. However, the School Board already went through these numbers with LCPS staff during their work sessions, and they have just as much interest in finding correct numbers as the BoS does. In fact, the School Board asked LCPS staff 138 questions that required further research and response regarding the operating budget prior to adopting it and another 10 in preparation for their work session with the BoS. This is the School Board's request, not LCPS staff's. It is much more likely that this $14 million reduction will come out of items considered less necessary than staffing for increased enrollment or new schools, such as extracurricular activities, transportation costs, and so on. The $14 million increase for technology requested by the School Board included $2.3 million for improving bandwidth and $7.2 million for refreshing old computers. The BoS news release suggests that the School Board spend $5 million on technology to specifically accomplish those two items. Unfortunately, that still leaves them $4.5 million short. The technology plan that the previous School Board adopted in 2011 intended to provide every student and teacher with a connected device. Every year since then, LCPS staff has proposed funding to implement this plan, but the plan has been continually deferred. This year, the School Board requested $2.2 million to expand a 1:1 pilot program begun last year from 1/3 of one grade in one middle school to two full grades in two middle schools. Additionally, the $2.2 million included funding to begin a Bring-Your-Own-Device pilot that would allow some teachers to be reimbursed for qualifying device purchases. Neighboring counties Prince William and Fairfax have already fully implemented BYOD in their schools. Another nine Virginia counties have begun or fully implemented 1:1 device implementation as well. Loudoun County, home of "Data Center Alley," including Verizon, AOL, and Amazon, should be on the forefront of this initiative, but the BoS apparently doesn't agree. Technically, the Board of Supervisors have not finalized the budget and tax rate. That will happen on April 2. If five supervisors can be convinced before that vote to increase the amount for the schools, the gap can still be decreased. Supervisors Ken Reid, Janet Clarke, Matt Letourneau, Shawn Williams, and Geary Higgins have all hinted at some point that they might support a tax rate above the equalized rate in order to increase the schools' funding. In fact, Reid asked for that the night before the vote, Clarke reiterated her support of it the day of the vote, Letourneau said he knows the Board as a whole won't support it so he won't ask for it, and Williams came close to sounding like he was going to ask for it at the end of the meeting. Perhaps it's all just lip service, but on the off chance it isn't, keep up the pressure. Let your supervisors know that you don't think their suggestions add up. To reach your supervisors office, call 703-777-0204. Everyone's supervisor is Scott York plus there's a representative for your district.